My new house has a large display cabinet that allows me to showcase my humble toy collection. It’s not a lot, because I only had a small display cabinet in my old house, and my practical personality prevents me from buying them. I mean, I never thought that I would move out of the house where I have enough room to house my collection. Besides, toy collection is never a priority at all. I recalled selling a bagful of dozen M.A.S.K. toys for less than $100, complete with boxes. That must have been a collector’s dream, but I decided to make room for more room to house practical stuff. I must have been fortunate enough to experience some of the collector’s toys that my family bought for me to play. Star Wars C3P0 (played until limbs detached from torso), Red Imperial Guard, X-Wing Fighter (diecast), they are all long discarded. I recalled loitering at United Square ogling at the fresh boxes of M.A.S.K. that I yearned to own. I was totally fascinated with M.A.S.K. and that it is the only toy line that I collected. I owned nothing from Centurions, G.I. Joe, or Transformers then. My parents were very strict with me with regards to toy purchases. I remembered I had to pay for my own toys, and even so I needed permission to buy them. During those 80s, the cheapest toy like the M.A.S.K. Piranha costs about $13.95, the larger sets like Goliath would cost more than $50. I remembered buying Rhino at a discount of $29.90 (probably an end-of-line sale). 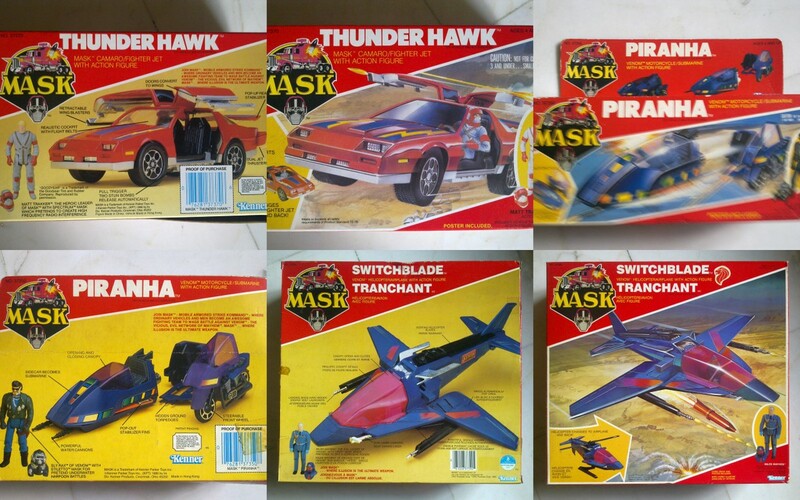 I also once owned Thunderhawk, Gator, Switchblade, Stinger, Vampire, Raven, Slingshot, Bullet, Buzzard, Detonator (wow, as I listed them down, I realised the amount of money I’ve spent on M.A.S.K. toys) At that era, it’s a lot of money. Thinking back, I wonder how my parents actually allowed me to spend that kind of money on toys, but I am grateful that they did. M.A.S.K. is great fun because it’s easy to transform from one vehicle to another, so you get double the fun with a single toy (today’s Transformers toy series are so difficult to transform – and fragile too – that it can take many minutes of delicate action to accomplish the task. The cartoon series also helped in evoking fantasy stories when playing with the toys. I even drew several books of M.A.S.K. comics! Over the weekend, I returned to my parent’s house, where many of my childhood toys still remained. I was pleasantly surprised to find that I still have a few M.A.S.K. “relics”: posters, instruction sheets, a few action figures, and empty boxes that I used to store other toys. No M.A.S.K. vehicles in sight, sadly. Another pleasant discovery of a toy that I almost forgot – Gatchaspartan! 旋風小飛俠! Gatchaman F, Battle of the Planets, G-Force, whatever you call it. It’s not the Phoenix-looking plane that it’s commonly associated with. This is a triangular jet plane formed by combining the 5 vehicles manned by each of the Gatchamen. I can’t recall how I convinced my parents to buy them for me at Isetan Outram, and I can imagine how expensive they must have been, because the build quality is really very good. In fact, it’s made in Singapore. I also can’t believe I kept every accessory that came with the toy, like the rocket launchers and the 5 mini-figurines. In those days, you do not buy toys for collector purposes. You play them, abuse them, and most of the time, lose them. As for Transformers, it’s a toy that I started to collect in recent years. The revival of my interest came about when I discovered that many of the characters are being remoulded with greater details and accuracy. The Autobot leader, Optimus Prime, has been successfully remoulded to look accurate in both robot and vehicle. But it appears there is no way Megatron the Decepticon leader can be remould to be accurate both ways – not beefy enough. While many collectors would buy every single Transformers product ever released, I go for those toys that look accurate when transformed both ways. Nothing irks me than a Transformer that doesn’t look like a robot as illustrated in the cartoons or movies. Transformers is really a grown-up toy because of the challenges in transforming the figures. A young child would easily rip it apart. Hasbro acknowledged that a majority of the collectors are grown-ups and so they have various versions (and prices) of the same character, ranging the “Legends” (smallest), “Deluxe”, “Voyager”, “Leader”, and “Ultimate” (largest) classes. 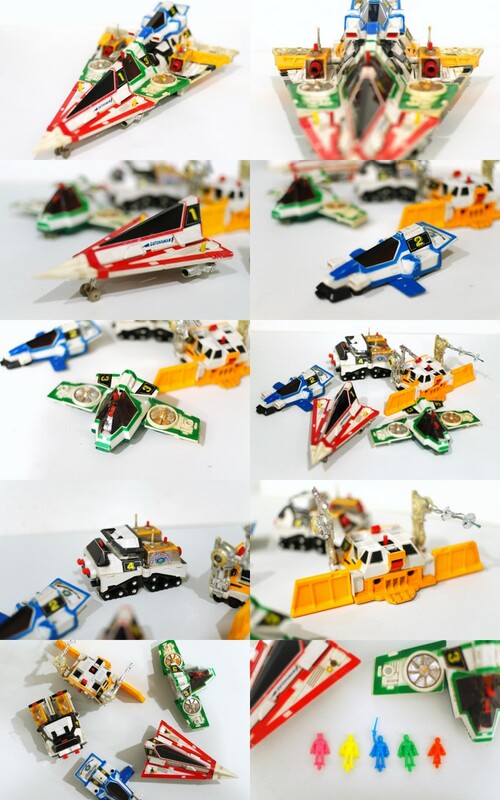 Interestingly, the Japan Takara-Tomy editions are more sought after by collectors because of the attention to details and the absence of laws governing the safety of the toys. Not that there aren’t laws in Japan, but the target market for these “collectors editions” is the grown-ups, unlike the U.S.-made Hasbro line that is meant for all-age mass-market. For instance, the Optimus Prime 20th Anniversary Edition smokestacks (above picture) are shorter than the Japan version. My latest and most expensive single purchase to date is the Takara-Tomy “Jetpower Optimus Prime” that consists of Prime and Jetfire that can be combined into a single figure, just like the movie. The issue with collecting Transformers is that the makers always come up with new variants that are better than the previous. I was almost convinced not to buy any Optimus Prime movie figures because I believed it can only get better. But the price offer was too good to miss, so I decided to just buy it and keep it until when I’m in the mood to play it (or sell it). In fact, some of the toys I bought months ago are only opened recently to fill up my new cabinet. Technically, toys that are opened will no longer have much value, but the irony is that most recent toys rarely appreciate in value unless they are true “limited edition” items. And even so, savvy collectors would buy them off and sell the extras to make quick bucks on eBay. More often than not, they end up selling below purchase price when the items proved to be less than desirable. I happened to pick up a few bargains from these “speculative collectors”. In all fairness, though I do hope some of my unopened toys could get some collector’s value, I’m really just waiting for an appropriate time to play them in future. Action figures have evolved too. Decades ago, these figures can only articulate 90-degrees on each limb joint in a single direction (like those M.A.S.K. figures I still have). Today’s figures can allow multi-degree joint rotation by using ball bearing. 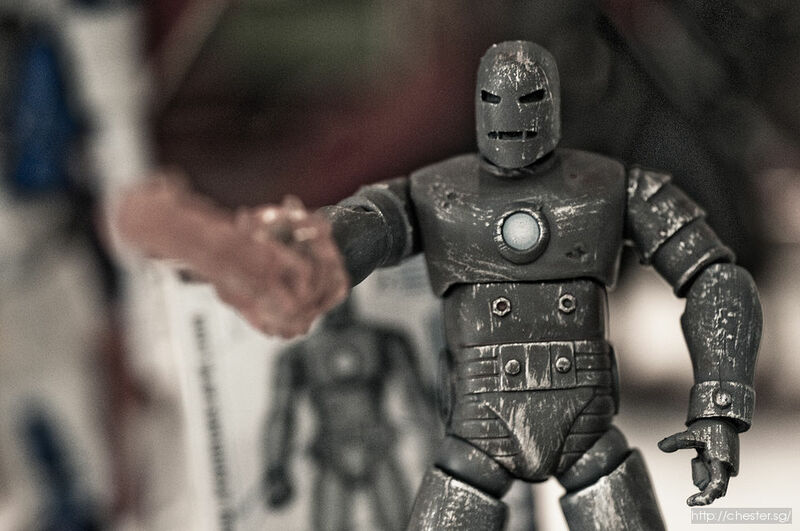 So for my latest grey Iron Man figure, the movable parts include: neck, chest, shoulder, elbow, wrist, thigh, knee, ankle. There is this “Revoltech” series in Japan where the figures are sculpted to be cartoon-accurate and the joints allow much better articulation, but are non-transformable. I recently got myself Megatron and Rodimus Prime (there was also Optimus Prime and Starscream but I did not get them because I already have them in alternate versions). I also bought Macross Valkyrie VF-1S Fighter because I recalled I used to have one. This Revoltech edition happens to be able to transform just like the cartoon. Nostalgic! I’m really not a hard-core toy collector. These toys that I bought selectively are capsules to my childhood memory. They signify a time of innocence and boundless imagination that I once possessed. While I might forget the movie I casually watched last year, I’ll always remember the impression I’ve had on the cartoon series I watched 2 decades ago. All photos shot using Samsung NX10 hybrid interchangeable lens camera, except the collage of M.A.S.K. boxes and the full cabinet shot. I really like that last picture. and i love the pictures of your toys too =) Old school Hasbro megatron! Pingback: Monsters University Roll-A-Scare: Disney Pixar Movie Merchandise – Music.Photo.Life.